It appears that those of us that love the duck won't have to wait too long for a completion of our collection. Today Walt Disney Home Entertainment announce wave eight of "Walt Disney Treasures". The next volume will be in stores all across America for the holiday season. What can we expect? • "The Chronological Donald, Volume 4": The last of the lovable duck with the bad temper is back for his final collection of animated shorts. The two-disc set will cover Donald's shorts released between 1951 and 1961. Another great note is all these shorts will shown in their original widescreen aspect ratio for the first time. Cool beans! I'm there... I'm there. • "Destino": This was the famous 1946 collaboration between Walt Disney and Salvador Dalí that was never completed. Roy Disney discovered this unfinished work while researching for another Fantasia sequel. He took up the task of completing this work that had been lost in time for most Disney fans. He completed it in 2003 and was nominated for an Academy Award. 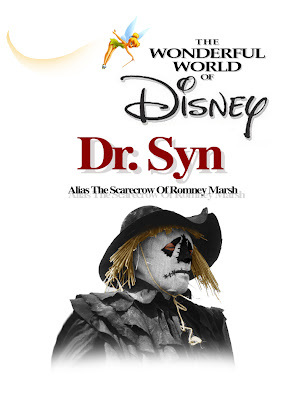 • "Dr. Syn, Alias The Scarecrow Of Romney Marsh": This is one I'm just giddy about. I was a huge fan of this story as a kid... having seen this on the Wonderful World of Disney over a series of Sundays and having actually read the novel adaption of it. It features Patrick McGoohan(The Prisoner, Secret Agent Man) as a sort of British Zorro-type character that fights the corrupt government in gloomy, old England. The DVD will feature all three episodes show on WWOD and the theatrical film version that was released across the pond. I'm getting all 3 as usual. Re- Dr. Syn: It would be great if they can get Mr. McGoohan to do a little interview. He's 80 now and it would be great to see him again. Thanks for the post. Nice article Mr. Lincoln, but it's from Volume 3, not 4. Oops, you're right my mistake! Thanks for catching that. ooh - does that mean (since they're out in 1959 and 1961) that we'll FINALLY get Donald and the Wheel and Donald in Mathemagicland?